After I mentioned her home business in one of my articles, "Party On...Consciously," Sunflower Bakery owner Janet Makaris dropped off a gorgeous cake at the Seven Days office. It's made with spelt flour with a layer of lemon curd (one of my favorite things) and maple fondant on top. And as you can see, was decorated with a beautiful flower. We'd never had a cake made with a non-wheat flour before -- Janet specializes in baking with alternative flours and sweeteners -- and my husband mentioned his surprised by how light it is. He associates spelt with dense, nutritious breads. The fondant was very sweet, but the tang of the lemon curd provided balance. It was decadent so we had small pieces, and I can't wait to have another one tonight! Today, while shopping for lunch at the Fresh Market on Pine Street in Burlington, I discovered a brand of caramels I hadn't seen before. 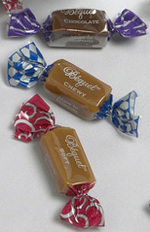 Called Béquet, the sweets are made in Montana and come in flavors such as maple, salt-chocolate, "soft" and "chewy." I opted for a trio: chipotle, espresso and salt. All three were delightful: soft, buttery and sweet, with just the right amount of chile, coffee and salt. I highly recommend these to caramel fans. If you wanna learn more about the company, check out this article.